Jeff has been serving customers in the Basin for 22 years. I live in a mobile home so I don't have to tell you how miserable it was when my central air went out! 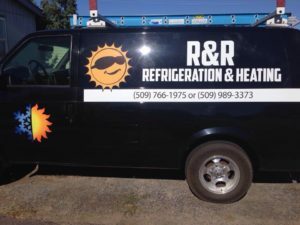 Jeff from R & R came right out (after hrs I might add) and fixed my AC. He was courteous and more than reasonable... definitely give this guy a thumbs up! Thank You! Best service with these people. My ancient heater went out and no other repair services knew why. Well they fixed it!! And thank god because i live in a paper thin mobile home so we need3d our heat repair ASAP. Highly recommend them they are great and reasonably priced. Saved me money by explaining over the phone what to do. Unfortunately, ended up having to replace entire AC unit. They gave me a good price and ordered and installed it very quickly as it was the hottest damn week of the year. Nice guys and professional for a small outfit, spoke well of the competition, did not badmouth them. Extremely happy with both service and sales. Highly recommend. I was out of town for a heat wave weekend and when I returned I found out my AC wasn't working. With the wife and young children at home in extreme heat we got a hold of Jeff and he came to the rescue. He came out promptly and had our unit up and running in now time. We had a nice nights sleep thanks to Jeff.